Looking for a high-quality muffler that has room for customization? 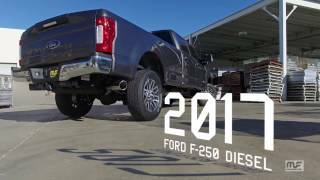 Magnaflow Pro Series diesel exhaust systems and your truck may be a perfect match. Available in T-409 stainless steel, or aluminized steel, Magnaflow lets you choose what option best fits your needs. Like all Magnaflow exhaust systems, the real meat and potatoes of the system are the mandrel bent pipes, increase pipe dimensions, and a straight-through muffler. All of these come together to give your truck increased exhaust flow, which boosts horsepower, torque, and fuel-efficiency. 1/2" overlapped welds protect your system from leaks, and increase durability. Non-DPF applications include a satin finished stainless steel or aluminized steel muffler, but do not include exhaust tips. Most DPF applications include a muffler-delete pipe, and all DPF applications include an inter-cooled exhaust tip. Don't worry, Magnaflow didn't forget about the sound. Their R&D department works hard to reach that perfect balance of deep, rich grumble, without going overboard and becoming overwhelming and obnoxious. 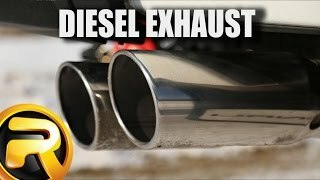 If you're in the market to boost the performance of your diesel truck, there is no better place to start than with the exhaust system. Looking for an exhaust system? You can't go wrong with a Magnaflow Pro Series diesel exhaust system. Get yours today, and get to tearing up the road. Pro Series allows for more customization, and is available in stainless steel as well as aluminum. Non-DPF applications include muffler, satin finish stainless steel or aluminum, but do not include exhaust tip. DPF applications includes a muffler-delete pipe, and an inter-cooled tip, but does not include a muffler. 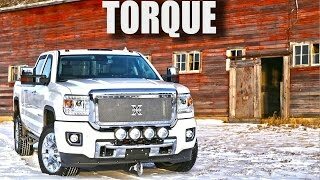 Top of the line exhaust system from Magnaflow. Includes polished stainless steel muffler, and double-walled tip for non-DPF applications, and polished stainless steel muffler, muffler-delete pipe, and stainless steel inter-cooled tip for DPF applications. If you want the best, this is a good place to start. 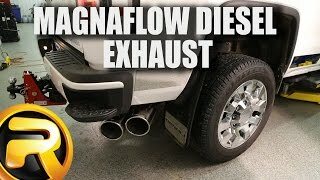 Second tier exhaust from Magnaflow. 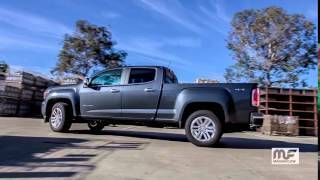 Very similar to the Performance Series, but without the bells and whistles. Non-DPF applications include satin finished stainless steel muffler and a single wall, clamp-on tip. DPF applications include satin finish stainless steel muffler, muffler-delete pipe, and inter-cooled tip. This series allows for the most customization of any line. Available in stainless steel or aluminum, the Custom Series is perfect for the builder who wants to choose their own converter, muffler and tip. Only available for non-DPF, includes a stainless steel or aluminum muffler-delete pipe, but does not include tip. Ready to put your personal stamp on an exhaust, this is a great place to start. The Black Series is the same exhaust system as the premier Performance Series, except it has a high-temperature satin black ceramic applied from the tail pipe to tip. Includes polished stainless steel muffler, and double-walled tip for non-DPF applications, and polished stainless steel muffler, muffler-delete pipe, and black ceramic coated inter-cooled tip for DPF applications. Built for the off-roader in mind, the Off-Road Series is built using stainless steel, includes a satin finished stainless steel muffler, but does not include a tail pipe. This line features a turn down tip, which is ideal for vehicles were tail pipe clearance could be reduced because of heavy trailering. The Off-Road Series is only available for non-DPF applications. Planning on bouncing around off-road and don’t want to wreck your exhaust, get the right exhaust, and stop worrying. Magnaflow backs the stainless steel Pro Series diesel exhaust systems with a lifetime warranty. Aluminum Pro Series diesel exhaust systems are backed by a 1 year warranty. If you have any questions, don't hesitate to give us a call at 877-216-5446. We are by the phone 7 days a week, a ready to answer quesitons. 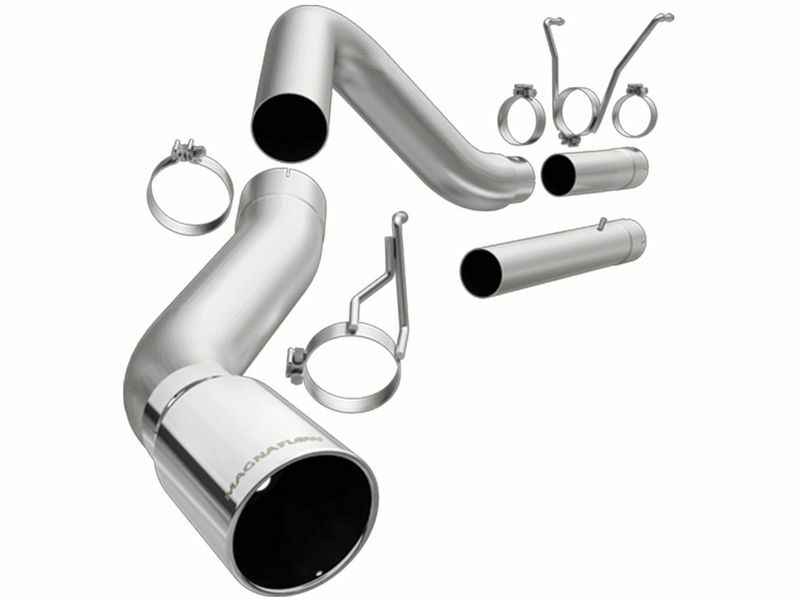 Magnaflow Pro Series diesel exhaust systems are easy to install, and do not require and drilling or cutting. All systems will include all the necessary hardware as well as instructions, making install a breeze, and allowing you to get out on the road. Have questions? Give us a call at 877-216-5446.